"Ladies and gentlemen, the time we have been waiting for has finally arrived. A baby has been born with... fruity colors!" A Mushsnail Tale is a testament to recent advancements in computer technology. Here is a nearly full-length computer animated feature, produced entirely by one guy, Scott Cawthorn, who apparently decided it might be fun to try his hand at Pixar-style filmmaking. Admittedly, the animation is a lot more simplistic than we're used to seeing on the big screen�though the backgrounds are richly imagined digital matte paintings, the characters are simplistic and blocky, and their movements stiff and unnatural�but you've got to give him points for effort. The story is rather routine, a carbon-copy of a classic children's book mold where the youthful protagonist has to go on a journey and face his fears to save his town. It actually reminds me quite a bit of a short story I wrote when I was in second or third grade, at least structurally (I think mine had more dangling plot threads and was rather more ambitious in scope, as it involved both futuristic technology and medieval weaponry, and a dragon, and it all took place on the moon). Anyway, it takes place in the town of Mushsnail, an earthy community populated by sentient mushrooms with no arms. Their hands just sort of... float around on their own. The armless elders are worried because the town's water supply is drying up, but are encouraged when an omen appears, a rainbow hued baby 'shroom whose coming signals renewal for the community. Someone simply needs to take him into the center of the forest (where few mushrooms dare to tread). The heroes are three young mushrooms named Chup Choo, Frup Foo, and Priss Poo. Accompanying them into the forest is their friend Frank, a pink flamingo (says Frank: "I'm not sure why I'm going along. It doesn't make much sense. But I look at it like this: I'm a flamingo living in a colony of mushrooms. Nothing I ever do will make less sense than that."). The group will face many perilous dangers, including rainstorms and the mysterious "musholith," which will memorably invade their very dreams (as if talking mushrooms weren't surreal enough, wait until you see what they dream about). Though the program is certainly targeted at young children (who probably won't mind the rough animation), the script certainly adds in some clever humor for adults (not unlike the Pixar films, or the popular VeggieTales videos). There are lots of fast-paced visuals gags and goofy wordplay, as well as a few references to The Lord of the Rings (my favorite involved a brave snail named Bill: "A weird, shrouded swamp is no place for a snail, even a snail as brave as Bill. Go on, Bill. Don't worry, Frup, he knows the way home. [Bill bonks into a tree twice] ...We'll just pick him up on the way out."). It would be easy to discount A Mushsnail Tale as mere simplistic animation, but I believe that would be selling the creators short. It has an amateur charm all its own, and was obviously a labor of love for all involved. Director/animator/voice actor Scott Cawthorn has put together an amusing short film that, if nothing else, proves that a Mac, a lot of time, and a lot of creativity can go a long way. One thing I enjoyed: all of the characters' voices tend to blend, and none are particularly memorable. Cast members (Cawthorn and his friends and relatives) don't try to pass themselves off as professional voice actors, and they are credited as voice "talent," with facetious quote marks intact. Image Transfer Review: This is a decent transfer, technically, and it is hard to say that any flaws are a result of the DVD mastering since the low-budget computer animation is likely full of small digital flaws already. That said, colors are rich and saturated and fine detail is fair (the intricate backgrounds look a little soft; more crispness and detail would show off the designs a bit more). There is intermittent aliasing and artifacting that could be attributed to either the animation or the transfer; either way, it isn't that distracting. Audio Transfer Review: Audio is presented in an unpleasant, muffled stereo mix. Dialogue sounds like it was recorded on an audio cassette and is always discernable, but rarely crisp and clear. The musical score fares a bit better, but still sounds rather thin. There is some occasional stereo separation for the sound effects. Extras Review: This independently released DVD includes no bonuses or features of any kind. There is no menu at all�the feature starts automatically when you put in the disc and there aren't any chapter stops. Once the show is over, it automatically restarts. 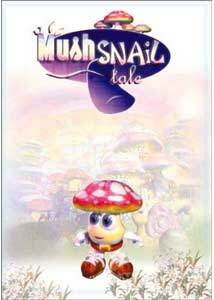 A Mushsnail Tale is a clever diversion that should amuse both kids and adults. The computer animation is rather crude by today's standards, but the fact that it was produced and released independently warrants respect.